Don't you just sometimes wonder what people hide in their bags? Specially in girls bag. We seriously have half of the things we own in our bags...because they are just endless. Sometimes I find some things which are long lost and surprise - they been hiding in my bag all this time. So a little organization and a blog post where you take everything out is needed. 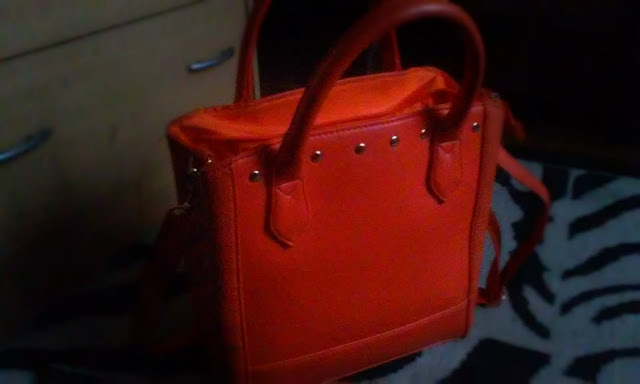 So I finally decided to show you all whats hidden in my orange hand bag. Earphones - Nowhere without these babes. I'm pretty sure you all know what I meant. Without music in my ears every drive in public transport is a nightmare....what can be more horrible than to listen to all those conversations or others music...Nothing. That's why I always have these in my bag no matter what. My planner - I'm a person who often forgets a lot of things or makes plans when already have plans. So that's why my planner (and I bought a new one in cute pink colour some days ago) is always with me and I write every little thing I have to do in it. Colourful pen's - I always have like two or tree different colour pen's in my bag so I can make my planner look more colour full on the inside....That's what happens when you write a lot. Wallet - This one's pretty obvious ins't it?I honestly think I could write a different blog post about 'what's in my wallet?' because there's always so many things in it and I can never really find the right card I need at the moment. A book - You can always find a book I'm currently reading in my bag, because I really love reading while driving to work or from work. It somehow helps me relax and like hide from everyone. Currently I'm reading Adele Parks book Whatever it takes. A bottle of water - No matter where I go or what the season it is bottle of water is always needed. I didn't realize this earlier but water is really important for our health and that's why I try to drink it as much as possible. My little cosmetic bag - This is the thing that is not always in my bag only at some times when I''m staying the night somewhere else or I'm going to our country side house. Otherwise I don't really see the need to take all those things with me everyday. Passport - Only reason why I'm keeping this in my bag always is that you never know when you suddenly will want a wine after long day right? But if all honestly, there's many times when I need to prove that I'm old enough or that I really am Annie and because I on't have any other identity cards I have to have my passport with me always. Also what if I suddenly have the opportunity to travel? Many different lip products - Lip balm's , lipstick's and lip gloss always have a place in my bag. Those are the things that always needs to be with you. Perfume or a body freshener - After work I always thing that I smell like a cup of coffee ( not that it's so bad) , so that's why I always have something to refresh yourself. Also it's a must-have in the hot summer days . A lot of small needed things - Hair bands, pack of gums, bobby pins, hair comb, some meds and more more more things like that are in my bag. These are the kind of things that always needs to be in your bag because you never know when suddenly you will have to redone your hair or someone will ask for pain killers. We, girls, always need to be ready for everything and our bags are the only place where we can put that ''everything'' right? So that's it. Of course it sounds pretty cool and organized when in reality my bag honestly looks like a big big mess and there's nothing I can do about it,but somehow I always are a able to find things when I need them.And how about you? What's usually in your bag?! I hope you enjoyed and also I hope you had the best Woman's day with lots of flowers, love and chocolate.